Joe has many years of experience and has worked on all makes and models. He grew up tinkering with vehicles with his father and began working in the motor industry at the age of 16. Experiencing a range of roles Joe found his strength and interest was in service and repairs, which led him to 11 years working for Land Rover specialists, Simmonites. Joe is a believer of quality replacement parts for your vehicle. Time and time again he welcomes new customers coming in to his workshop who have repeated problems with their vehicles as a result of cheap/imported/sub-standard parts. 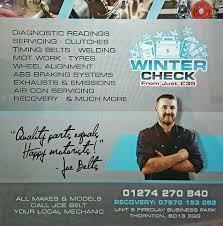 At Belts Autos customers leave confident with a 12 month warranty on all parts. Since establishing his own workshop at the beginning of the 2016, Joe has been extremely busy. He already has a strong base of repeat customers partly due to his commitment to customer satisfaction.